Kelly and Wayne Maines adopted infant twin boys, but from a very early age it was obvious that Wyatt didn't consider himself a boy at all. As the twins grew, Kelly learned everything she could about being transgender and how to help her kid be the girl she knew she was. Gradually, Wyatt began wearing his hair longer, adding feminine colors to his wardrobe, and eventually changing his name to Nicole. School was challenging though, and the middle school that Jonas and Nicole attended in Orono, ME eventually made Nicole stop using the girls' bathroom after a complaint. Thus began a tumultuous couple of years in which the family filed a lawsuit against the school, Jonas and Nicole had a very tough time at school and ended up changing schools a couple of times, and Wayne had to live apart from the rest of the family because of his job. 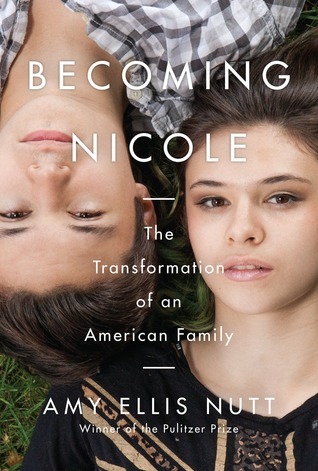 This isn't the first book I've read about the experience of being transgender, but I still learned new things. It was pretty short and moved quickly with its short chapters, and even the science parts were easy to digest. For people who are still uncomfortable with the whole idea that transgender people even exist, I think this would actually be a very good book to start with. Something about the way this story is told from the very beginning of Nicole's existence just makes it all unfold in a way that feels perfectly natural. Of course it is natural, but my point is how well that is illustrated in this story. One big challenge from within the Maines family was that Wayne couldn't really warm up to the idea that his son was really his daughter. You'd think that having another son would cushion that blow a bit, but it really took him a long time. However, even this conservative traditional guy who couldn't quite wrap his mind around this concept never for a moment considered that any of it would mean that he didn't care as much about Nicole. He knew he needed to accept her for who she is and protect her against those who wouldn't, and he rose to the challenge quite magnificently. There were moments reading this book that I got SO MAD. I mean, people can be incredibly stupid and mean. The kid who complained about Nicole using the girls' bathroom, which led to a years-long legal battle, was influenced by his awful grandfather who was involved with one of those hateful allegedly-Christian groups who want to get in everybody's personal business. They acted like Nicole was some sort of sexual predator for using the girls' bathroom. (And I just could not help but picture that kid as Draco Malfoy, but that's probably because I was listening to Harry Potter while reading this.) Anyway this whole bathroom issue has just gotten all out-of-proportion on a national level, and doesn't even make any logical sense. Can we please just let people pee in peace? As long as it's in a bathroom of some sort, we should all be satisfied. But I digress. If you want to learn more, Nicole did a TED Talk that's only around 13 minutes long and is totally worth watching. I especially like the part where she brags about being better at sports than her brother, and says she can hit a home run and could do it in high heels. (Ha!) And of course, read the book! It's short! Other books on the topic that I recommend are She's Not There by Jennifer Finney Boylan (who was mentioned in this book as well) and Andrew Solomon's Far From the Tree which has a chapter on transgender kids, and which is on my extremely short list of books that everybody should read. I had heard of this book because it's popular right now, but the only reason I actually picked it up is because it's on the short list for our community read, so I had to read it. But I'm really glad I did! Not only does it take place kind of near where I grew up in Maine (and at one point the family visited the town of Machias, with which I am extremely familiar), but it was a really well-told story about the journey of a normal family facing unusual challenges that just should not have been quite so difficult for them. They seem like really nice people and I'm so glad things have worked out. Nicole seems like a great kid and she deserves every opportunity for happiness. Her story is sad and frustrating at times, but mostly it is inspiring.